Book Jacket: "Abandoning her worldly life, traveling to a remote Wisconsin town in the dead of winter, trusting her future to a man she had never met---such was Catherine Land's new beginning. But there was an ending in sight as well, an ending that would redeem the treachery ahead, justify the sacrifice, and allow her to start over yet again. That was her plan. For Ralph Truitt, the wealthy businessman who had advertised for "a reliable wife," this was also to be a new beginning. Years of solitude, denial, and remorse would be erased, and Catherine Land, whoever she might be, would be the vessel of his desires, the keeper of his secrets, the means to recover what was lost. That was his plan. Set just after the turn of the twentieth century, A Reliable Wife is the story of these two people, each plagued by a heart filled with anger and guilt, each with a destiny in mind. But neither of anticipates what develops between them---the pent up longings that Catherine discovers in this enigmatic man and the depth of her own emotional response; the joy Ralph experiences in giving Catherine the luxuries she has never known, his growing need for her, and a desire that he thought was long buried. 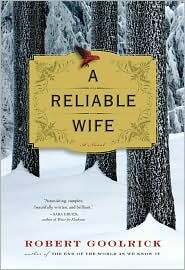 Seductively suspenseful, filled with unexpected twists and turns, A Reliable Wife is a debut reminiscent of the classic novels of the Brontes and du Maurier. Unfolding in a frozen Wisconsin landscape, it's a haunting story of love and madness, passion and murder." Taryn's Review: This book was a mixed bag for me. Sometimes I really got into what was happening and felt like I understood the characters. Other times, I was disconnected from them all, especially when I felt like the flow of the book was off. Catherine Land was presented mysteriously, but to be honest, I would have loved to know her story before I learned of Ralph Truitt's. To me, Ralph should have been the mystery. Who puts an ad in the paper for a wife, especially an insanely wealthy man who most likely had many options in his daily life? It wasn't odd that many women would reply, nor was it odd that many would lie, like Catherine did, to try and become the wife of a very wealthy man. Also, Catherine and Ralph apparently both have the same desire to right wrongs from the past. Ralph's wrongs were introduced quickly, while Catherine's wrongs suddenly appeared in the middle of the book with no foreshadowing of it. I really think Catherine's guilt should have been highlighted much, much sooner to make it more believable. The book claimed to be a story of despair and it is at times. I don't know how much I believed in the patience of Ralph Truitt in the book, but I could believe in the change in Catherine. Overall, I'm not sure it's a book I'd recommend to many people, but it does a have a quality about it that makes you keep reading. It's not an amazing debut novel, but certainly not a bad one. The flow of the story was a bit off for me, especially when Catherine encountered Antonio on her own, yet, something kept me interested. I think Goolrick has a definite talent, I'm just not sure this book fully expanded on it.